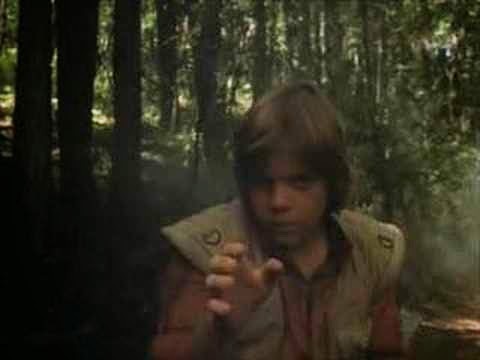 Once upon a time, many months ago, I posted a entry about my experience watching Battle for Endor. 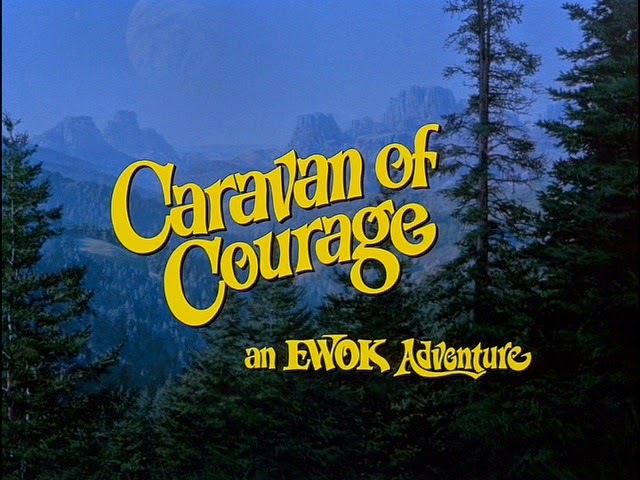 Since its been so long since my last entry, I thought I'd pick things up and visit the previous chapter to the Ewok saga - sort of the Attack of the Clones to A New Hope, if you will. The last time I watched a movie for you, was Last Action Hero which featured Arnold Schwarzenegger doing his Arnold Schwarzeneggingist to portray a human actor, which as we all know, he failed on all fronts. 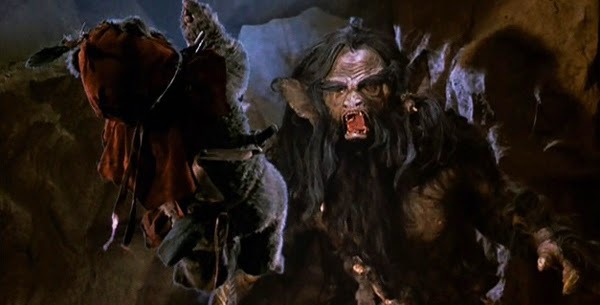 This time I around, I watched a film where the majority of the actors are fuzzy bears with spears (and they say there's no diversity in Hollywood), all displaying more emotion, and more depth of character. 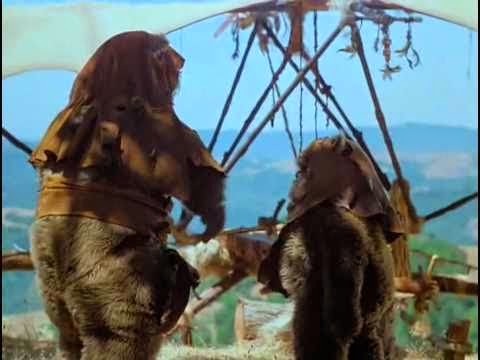 Producer: "So our writers have a couple of storylines they'd like to share with you--"
Executives: One of them better be about Ewoks. 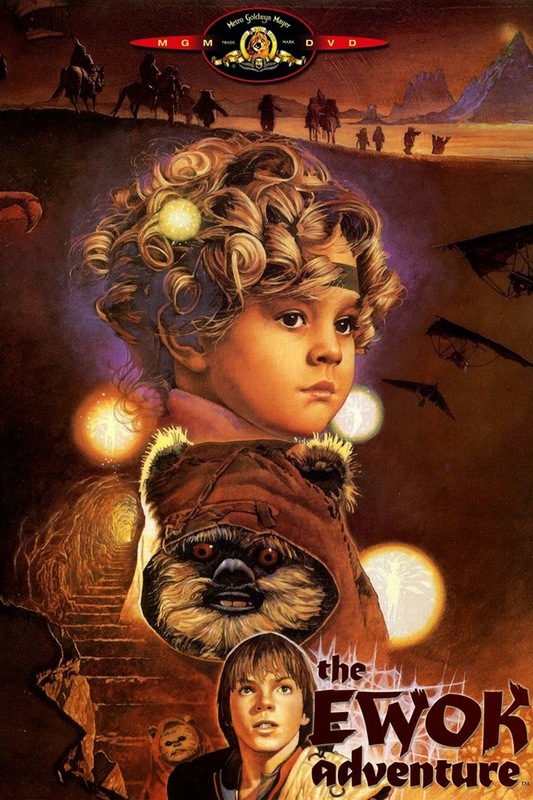 Kids love ewoks." Producer: Yep, got one right here. 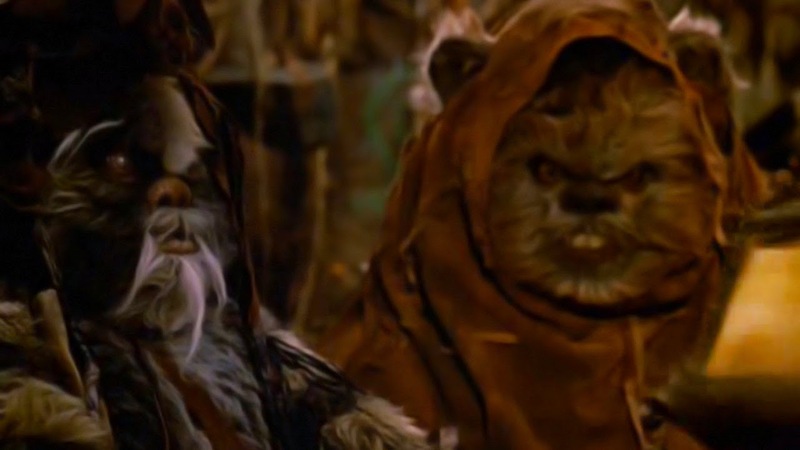 Its about a ewok and definitely not a jedi on a quest. Executive: You know whats hot right now? 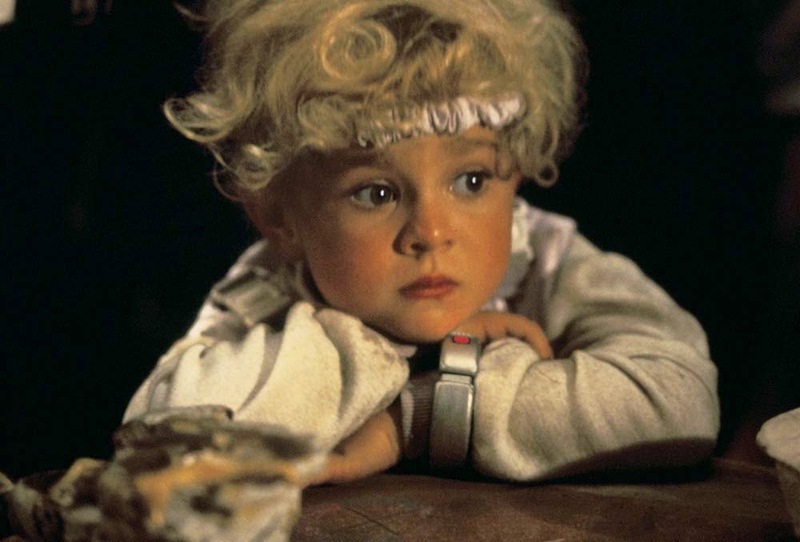 That kid from E.T. Executive: Sure, get him too if you can get the girl. Executive: Is that her name? Which I can say there is a caravan, but there's very little courage. 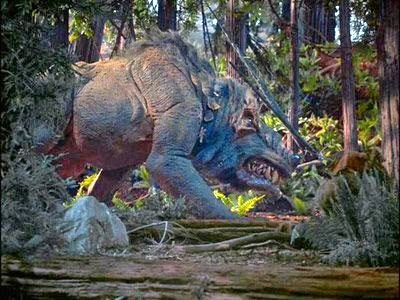 Mr. and Mrs Brady get lost while trying to find their kids, leaving their jobs to the figment of George Lucas' imagination. 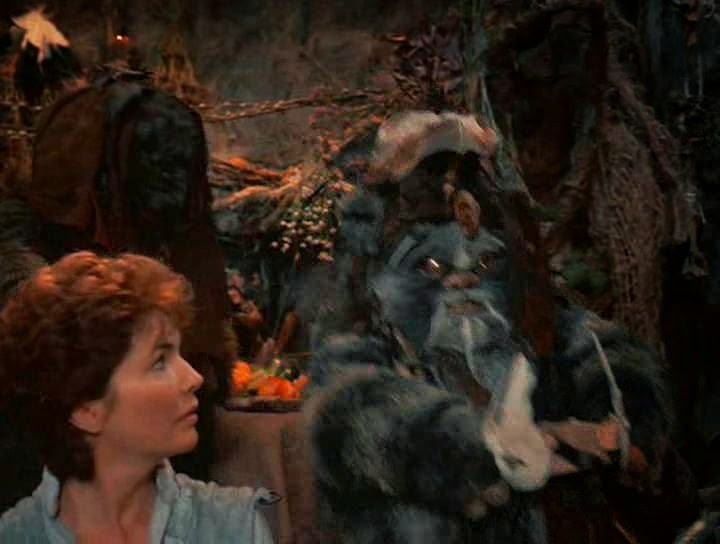 The kids wander into the Ewok village where Cindy, sorry "Cyndal" gets sick, blows their cover and throws the whole village in danger of contracting whatever virus she has but is foreign to them. 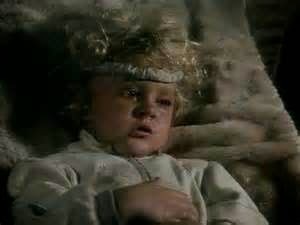 It should come as no surprise that this little angel is the best actor in the whole production. She cries real tears, she shows concern at the scene she's in and she speaks her lines as opposed to shouting them like Peter Brady-Kenobi. 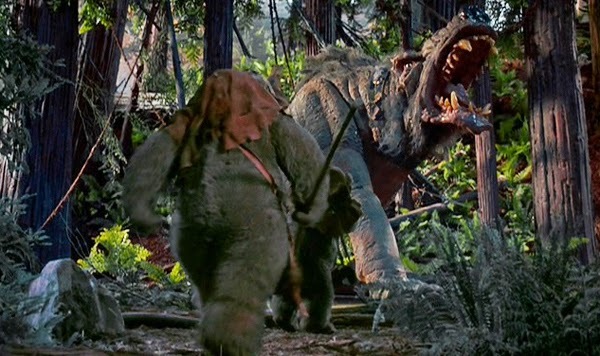 Before all this started, we were introduced to Wicket, aka, the only Ewok you remembered distinctively from Return of the Jedi, sets the precedent for what he'll be doing for the rest of the movie: Flailing his arms like a mutant panda and screwing everything up. Like this scene where he nearly sends his father (? I think. 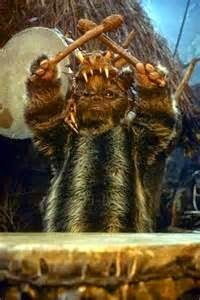 Relationships among Ewoks aren't clearly outlined) to a free fall of a death. 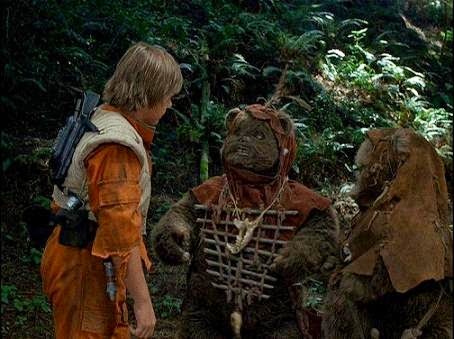 In a decision that required no deliberation, no planning and no forthought, the Ewoks decide to help the Brady kids find their parents. Probably because no one wants human kids around with free floating viruses that would no doubt be fatal to a fragile immune system. 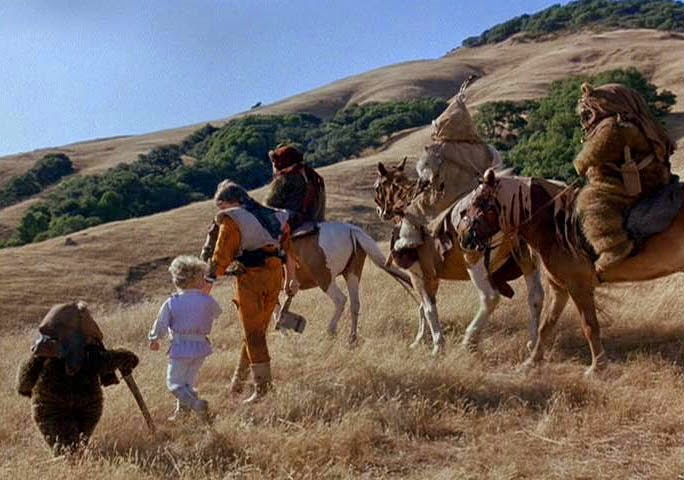 Regardless, they head out on their "caravan of courage" which really is just 60 minutes of them wandering all over various landscapes, stumbling into dangerous situations either caused by Wicket or Peter Brady. 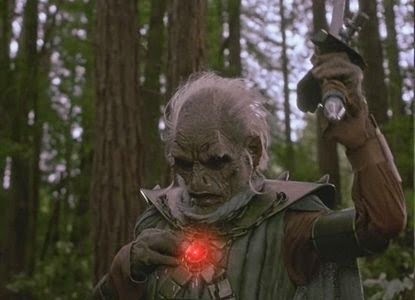 Look, I realize that Star Wars was ahead of its time with its special effects and there are just some things that you can't do for television in the early '80s. Which can be the only explanation for why a monster made of Play-doh comes out and tries to kill everyone. Apparently it was terrifying, even though you could see the fingerprints on the clay. For those of you concerned with your childhood being killed at this point, may I remind you that that time has long past and I'm just here cleaning it up. Most of this movie is narrated by a burly voiced narrator who reads it the same way one might read a childrens book. "And so the children walked from dense forest to desert, back to dense forest where something jumped out at them and back into desert where Peter Brady complained the whole time." "Peter had a lot of unresolved anger issues which led him to threaten forest creatures with firearms at the drop of a hat. But they pressed on, hoping he would snap out of it." Lets go back into the forest, where the childrens' minds are open just long enough to come face to face with this horrible demon possesed dried apple head. 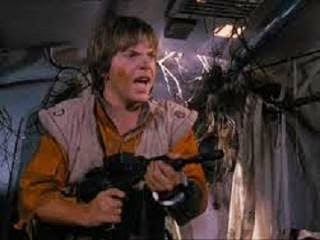 And Peter Brady kind of sort of uses the "force." Which he only does once and never does again when bigger things happen. Why? you ask. Its a good question, but it seems the movie quickly said, "Hey, what's that over there!" which we then did and the movie quickly ran out of the room, jumped into its car and we didn't hear from it again. 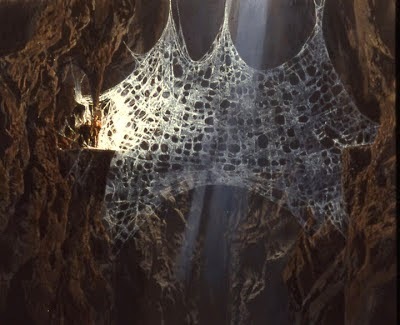 "So the children and the Ewoks wandered into this cave, and thought it'd be fun to climb this spiderweb. It was kind of dangerous when a spider was dangled down on a string and victoriously swatted away. But they pressed on and made it to the other side, which they happened to realize led to where their parents were held hostage. They weren't expecting that." I don't know what this thing is, all we know that it grabbed Mr. and Mrs Brady, stuck them in a tiny cage. 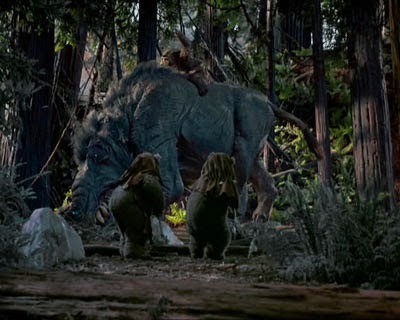 I also know it has a disproportionately small mouth that an Ewok couldn't fit through. 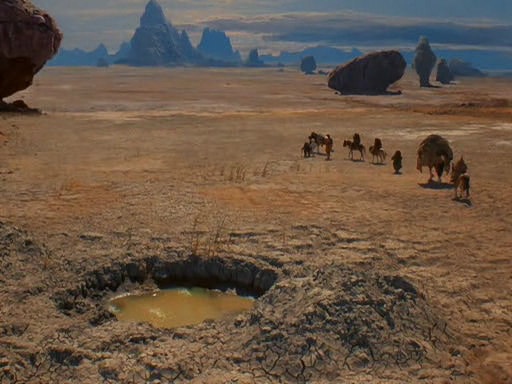 But hey, its George Lucas' universe, we're just stuck wondering what on earth he's doing. I'm not defending the actions of kidnapping and terror but you have to admit this thing is probably just really lonely and wanted something to take care of. 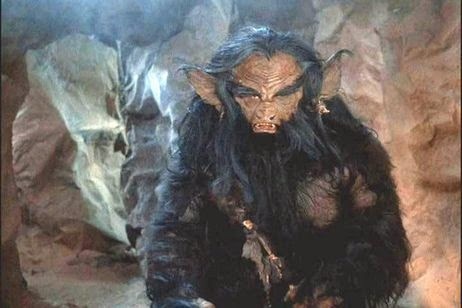 He lives in a cave that's really hard to get to and hygiene is not a priority. People don't come around and he's not getting invited to any book clubs. 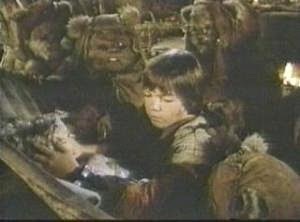 If you haven't already, "like" our Facebook page and discuss whether or not Ewoks have the capacity for empathy.